If you want to maximize fun for as many students as possible, this playground set is a real winner. With tons of great features and an enticing design, each child can easily find an activity they will enjoy. Students can race down the three-track Thunder Slide, jump on the bridge or climb their choice of stairs, ladders and bars. 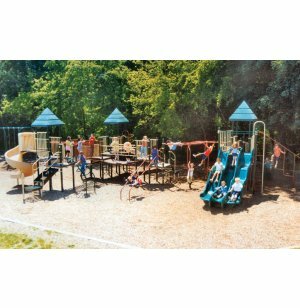 This playground is ideal for a large elementary school. It can accommodate up to 100 children, which is especially convenient when everyone goes out for recess together. The sturdy rotation-molded platforms will support years of outdoor exploration and fun. 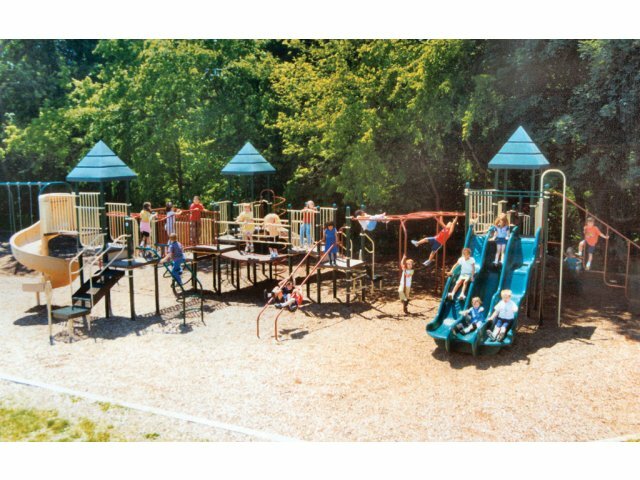 Encourage your students to climb high and get active with this unbeatable playground set from Kidstuff Playsystems. Endless Enjoyment: Packed with the most popular climbers and slides, including tons of great features like the "Alpine Thunder Slide" with 3 different bed ways and 3 different rides. Shady Play: Roofs over three of the platforms keep kids cool, even when it’s sunny out.